A lot has happened since MEGADETH released Super Collider (2013). Dave Mustaine lost his mother-in-law, David Ellefson lost a brother and drummer Shawn Drover and guitarist Chris Broderick left to form their own band, ACT OF DEFIANCE. With bassist David Ellefson off working on the METAL ALLEGIANCE project, Dave Mustaine was unsure if he would be involved in the recording. But Ellefson finished in time to work on Dystopia and MEGADETH has somehow — against great odds—released one of the best albums of their career. It is their most aggressive, heaviest, thrashiest album in many years. It really is an intriguing turnaround for this band. 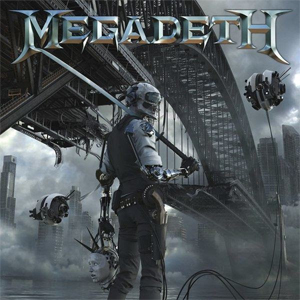 Dystopia is the album MEGADETH desperately needed to make after the mediocrity that was Super Collider, an album which for me only had a few worthwhile songs on it. My expectations for another MEGADETH album — with yet another lineup — were very low. But I have been a fan for over 30 years, and I have bought every album/CD when it was released, so it would be no different with Dystopia. I bought the Best Buy edition of the album. It includes two bonus tracks, “Look Who’s Talking” and “Last Dying Wish”. (There are two additional bonus tracks: “Me Hate You” and a cover of BUDGIE’s “Melt The Ice Away”, available on the Japanese version and Spotify, respectively). First of all, this is not the first thrash album to be named Dystopia. Former MEGADETH tour mates ICED EARTH released an album with this same name in 2011. Whereas ICED EARTH’s (excellent) album concentrated mainly on dystopian movie themes, MEGADETH (i.e. Dave Mustaine) has focused his attention mostly on the real world and its actual sad state. The mining of Brazilian power metal legends ANGRA for members continues with the selection of guitarist Kiko Loureiro, whose playing simply destroys on Dystopia. An amazing performance that features him trading licks with Mustaine and injecting major energy into the songs. LAMB OF GOD drummer Chris Adler also turns in a devastating performance; it is among the best on record for MEGADETH. David Ellefson’s bass work is also amazing here. Dave Mustaine has never sounded better. His vocals are more aggressive and he is using the tone I’ve always liked the best. The current state of political and social affairs has inspired him to spit out some of his most venomous lyrics in years. He even drops an F-bomb here and there. First track and single “The Threat Is Real” blasts out of the gate with a deadly ferocity. There are some cool lyrics and guitar leads here that work well. The excellent title track “Dystopia” follows, and reminds me of “Holy Wars…” and “Hangar 18” in parts. It is a dose of raw nerves and warnings against political corruption. After a grinding intro, “Fatal Illusion” kicks in to sever your head from your body. Dave serves up some fantastic lyrics about an execution gone wrong in this track. “Death From Within” was inspired by the movie Troy and the tale of the Trojan horse. This is one of my favorite songs on the album. “Bullet To The Brain” is a solid track, which finds Kiko playing an acoustic guitar intro and a piano outro. “Post American World” discusses world politics and “Look Who’s Talking” is a classic middle finger by Mustaine against someone who has offended him. “Poisonous Shadows” is one of the more epic tracks on Dystopia, featuring a lengthy intro with acoustic and electric guitars. There is also a piano outro provided by Kiko. “Conquer Or Die” is an excellent instrumental, featuring another acoustic intro. This song sets up the punishing “Lying In State”, one of the more aggressive tracks on the album, again focusing on politics, this time the decline of western civilization. “Last Dying Wish” is another fast-paced track. The cover of FEAR’s “Foreign Policy” is excellent as well. Thankfully, Vic Rattlehead returns to the album cover. Brent Elliot White’s foldout artwork is among the best album covers the band has ever had. Pretty much everyone uses Rust In Peace as a benchmark for greatness of MEGADETH. Dystopia may not quite be Rust In Peace, but it’s pretty close. Hey, I’m as surprised as anybody! This album is awesome. Play at full volume. Grab your copy of Dystopia in the KNAC.COM More Store right HERE.